Campaigners have accused ministers of failing to deliver on promises to put funding into natural flood management (NFM) techniques. A Freedom of Information request by Friends of the Earth (FoE) to the Department for Environment, Food & Rural Affairs (DEFRA) revealed that ‘at the time of writing there is no funding earmarked specifically for Natural Flood Management’. FoE said there have been many recent indications that the Government would introduce NFM schemes, including promises from ministers to fund NFM measures, suggestions that a £700m pot of funding announced in the Budget would be used for ‘innovative’ flood defence measures, and civil servants recommending specific NFM projects for funding. FoE said it ‘understands’ that former floods minister Rory Stewart MP earmarked £20m for natural flood defences before he left DEFRA in June. FoE said a former senior official at the Environment Agency (EA) confirmed to it that ‘Defra have commissioned us to provide them with a set of proposed Natural Flood Management work packages totalling £20m’. But, it said, there has been ‘no sign’ of this money since. FoE climate campaigner Guy Shrubsole said: ‘Last winter’s floods were a powerful reminder that we need to work with nature to reduce flood risk – and ministers wholeheartedly agreed. But so far it’s been all talk and no action – the Government has failed to spend a single extra penny on natural flood management. A Defra spokesperson said: ‘We’re committed to better protecting the country from flooding and natural flood management plays an important role in our strategy. 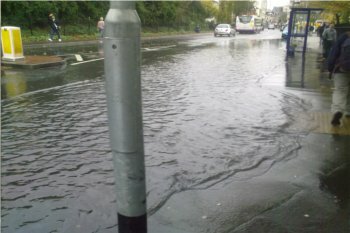 Separately, the EA warned communities in the south west, particularly Devon and Somerset, and parts of the north of England to be prepared for possible flooding and disruption on Monday (21 November) and Tuesday.